It is a very good opportunity to explore and exchange with other traditional cultures and ways of life. We can provide you with visits to ancient Palaces, Monasteries, Nunneries and Typical Local family, fixing camp in a particular village for sharing time with a family and helping them in a range of jobs. 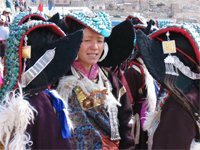 At the same time you will have an opportunity to visit and experience the rich and traditional culture as Amchi (Tibetan doctor), Tsispa (the astrologer) and Onpo (The Tantric man). You can also experience many aspects of their local life styles, farming, wedding ceremonies and managing their house hold by talking and sharing your time with village people. 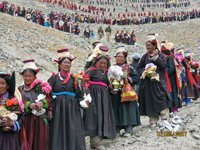 On your request we can organize cultural activities of the region such as tradition folk songs and dance performances by village men and women, horse riding festivals, playing Dartses (archery game) the well-known ancient sport of Ladakh. This kind of tour will cover some particular valleys and villages. You will be transported by jeep, buses, or even on horseback in some particulars places. The camp will move day-by-day from village to village according to your requirement.